Chapel of 1841. Red brick, Flemish bond, with stone pediment cornice, stone 1st floor sill band to front and stone sills. Brick eaves cornice to sides and gauged brick round arched lintels. Slate roof. 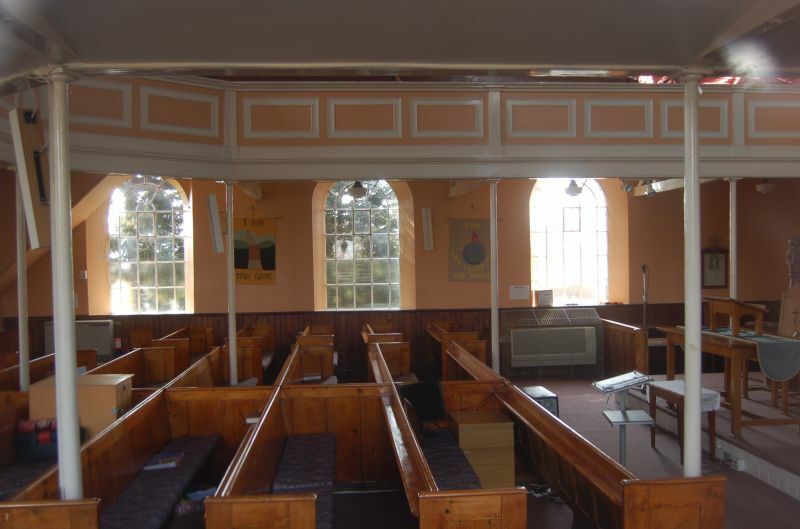 2 storeys of 3 small-paned round arched windows: gable end forms large pediment over all. Central door, formerly window, of 2 leaves with large overlight, upper part curved with segmental arch over. Either side a window with round arched heads and stucco sills replace the 2 doors formerly there. On left side 3 windows and on right 4 windows: upper right blocked and C20 door and window beneath. A C19 extension to rear of lesser interest. Interior: gallery to 3 sides on slender iron columns, 4th side later. Box pews possibly altered. Date: tablet in pediment: Baptist Chapel 1841.